The nationalist movement provided, particularly after 1920s, a broad framework of ideologies for political parties in India. Nationalism, socialism, secularism and democracy became the main plank of the Congress during last leg of the freedom struggle which remain so till now. After independence, a section of political parties including Bharatiya Jan Sangh emphasized on a nationalist movement based on rejuvenated Hindu values and thought. The communists wanted to unite the freedom struggle with social revolution leading to the establishment of the rule of the proletariat and peasantry guided by Marxism-Leninism. Thus, during formative years, the ideologies of political parties were based on socialism, secularism, nationalism, Hindutva and Marxism. Of course, there were parties based on religious identity, such as Muslim League and Shiromani Akali Dal (SAD) which visualized religious communities as separate political entities. The people within the Congress Party held different views and were categorized as rightists, centrists, and leftists. The first group within the Congress Party who opposed the overall policy of the Congress were the Socialists, who left the party in 1948, and formed the Socialist Party. The Socialist Party underwent several splits and reunions. In 1951 Kripalani formed KMPP but after 1952 elections, KMPP and Socialist Party merged to form PSP, so that an anti-Congress non-communist group could be forged. In 1955 Lohia left the PSP and revived the old Socialist Party. Again in 1964 SSP was formed as a result of the merger of the Socialist Party, with the PSP. 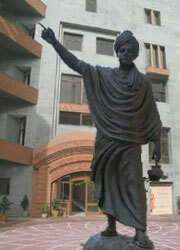 Another group in the Congress Party led by C. Rajagopalachari who proclaimed their opposition to the Congress policy of giving a big role to the state in regulating, directing and changing the national economy and raising the public sector to the commanding heights came out of the Congress and founded the Swatantra Party in 1959. The Swatantra Party stood for a liberal ideology. This party, however, soon went into oblivion, though it performed well in the 1967 General Elections and emerged as the second largest party in the Lok Sabha. There was split in the Congress Party in 1969. The split was known between radicals led by Mrs. Indira Gandhi and the conservative elements led by the old guard of the party called the ‘Syndicate’. But in fact, ideology did not play any significant role in the split. The birth of the new Congress Party under Mrs. Gandhi’s leadership was attributed more to the changed style of functioning of the Congress rather than to any changes in the party ideology. The later development showed that Indira Gandhi’s ideological vehemence and radical slogans were only a means to establish herself as an undisputed leader of the party. The relation between the Congress and Socialists was always ambiguous. There were differences on co-operating with Congress which were in a way responsible for the splits in the Socialist Party. The ideological opposition to the theory and practice of Communism and formal adoption of the objective of building of socialistic pattern of society by the Congress made the position of Socialists virtually indistinguishable from that of the Congress and drew them closer to the Congress Party. Narendra Dev and Lohia opposed any tie up with Congress. In 1953 talks between JP and Nehru on co-operation failed. In 1962 Ashok Mehta was expelled from the PSP and he joined the Congress as a cabinet minister at the centre. The most vigorous opposition to the Congress came from the Communists. Soon after independence the Communists waged an armed struggle in some parts of the country to overthrow the Indian Government. But soon the Communists gave up the path of armed struggle and joined the democratic process of election. The ideological debates on the character of Indian states, path to revolution in India, strategy and tactics of the revolutionary path led to several splits in the Communist Party. However, their participation in elections and success in forming and running governments at the state level firmly placed them in the arena of parliamentary politics. The splintered groups which believed in armed struggle were further split into several groups and later merged into one group named as CPI (Maoist) which is engaged today in guerrilla warfare against the established government. Interestingly, after the inner debate in the party over the character of the Indian state and revolution, the undivided CPI came to the conclusion that it should support the Congress Party and form a united front with it. The other section which took a hostile attitude formed CPM in 1964. The split in the CPM and formation of the CPI (ML) and other revolutionary groups based on Maoism in 1967 and the splits within splits of these groups show the salient differences over strategy and tactics among the Communists. However, a closer examination of splits among the Communists reveals the interpretation of leadership rivalries, personality clashes, organizational matters and programmatic positions. After the split in the Janata Party in 1979, its constituent Bharatiya Jan Sangh formed the Bharatiya Janata Party (BJP) in 1980. Besides adopting the main ideological base of the erstwhile Jan Sangh, the BJP adopted Gandhism, socialism and Cultural Nationalism as its ideological plank. The main reason for the BJP’s rise in 1990s was its forceful presentation of Indian nationalism and stiff opposition to the Congress programme of Muslim appeasement. It awakened the people against the danger posed by the Congress to Indian culture and the values of Hindutva. Its ability to penetrate into the middle class, to redefine nationalism and articulate the cultural and material aspirations of the people helped the BJP to consolidate itself. Its ability to redefine itself, expand its social base and forge alliances with regional parties helped it significantly in its rise. In the functioning of political parties, caste, religion, language and region also have acquired ideological overtones. The Muslim League during the pre-partition days claimed that Indian Muslims constitute a separate political community. Islam and Urdu provided the two distinguishing marks. After partition the Muslim League was revived in 1948, although there were splits in it later. The AIMIM in Andhra Pradesh is the continuation of the Majlis of the Nizam period. It is mainly based in Hyderabad city, it almost exclusively appeals to the Muslims of the state. Similarly SAD of Punjab has its roots in religion and its membership is restricted to Sikhs only. The leaders of the SAD believe that the Sikhs constitute a separate political community (Panth). The Akal Takht is the highest seat of religious and political activity. The SAD launched a campaign for a Punjabi Suba (separate state for Sikh) that excluded the Hindi-speaking areas and included areas where Sikhs are in a majority. In 1970s and 1980s it carried out a militant struggle for Khalistan. There are Christian parties too in the country, as in Kerala. Language and region also acquired the nature of ideology. As language and region grow together, regionalism takes the form of linguistic nationalism. When they are further combined with religion, culture, or ethnic identity, they become a powerful force. It is witnessed in the South, West and East, in the emergence of several regional parties and separatist groups. The consolidation of TDP, rise of Shiv Sena, AGP, BJD (and its earlier version Utkal Congress), National Conference and PDP in J&K, JMM, Trinamool Congress etc. shows how region has the potential to assume the form of an ideology. With the emerging trend of the formation of regional parties, centre-state relations are getting strained. Leaders of the regional parties demand more powers for the state in a federal frame work. This trend has also given rise to the decline of National Parties in those states as it has resulted in consolidation of regional parties. Regional identity and interests remained a potential issue for political mobilization. Often this has taken the form of centre-state problems. However, the ambitions of the leaders of regional parties generally do not remain confined to the region only and they also tend to catch up with national aspirations and therefore, they compete with the national parties for power. They therefore, adopt belligerent postures particularly against the Congress, the established national party. The BJP, the more nationalistic of the national parties, quickly grasped this emerging trend and forged alliance with these parties. Later the Congress too followed suit but it is yet to come to terms with reality of co-existing with the regional parties. Inspite of different ideological positions, to get themselves registered with the Election Commission, it is mandatory for all parties to declare themselves as secular, socialist and democratic. It is a different thing as to how they interpret these principles. Even parties who appeal to people on the basis of caste and religious identities regard themselves secular. For instance SAD, Muslim League, National Conference, Kerala Congress and Shiv Sena too stand by secularism. They say that they stand for secularism and oppose pseudo-secularism. BSP stands for emancipation and empowerment of Dalits and so on. This is the way how Indian parties have evolved and the values of secularism and socialism have been internalized in the Indian psyche. Except in the initial years after independence, ideology did not become a bar to forge alliances among the parties. The Communist and Muslim League fought elections in Kerala together. Both Congress and CPI could forge alliances and together and they could arrive at electoral understanding in that state. The coming together of socialists, former Congress men and the Jan Sangh to form the Janata Party showed that ideology is no hindrance in party chemistry. Interestingly, the CPI and Jan Sangh, ideologically poles apart were the constituents of Samyukta Vidhayak Dal government (SVD) in Bihar, in 1967 led by Karpoori Thakur, a Socialist. Thus, we find that relation of any party with any other is not fixed on ideological position. Parties are always ready to make compromises due to electoral compulsions and political requirements. The coalitional arrangements change as per the requirements of situation. Some of the socialists joined hands with the BJP in 1998 and they are happy together since then. DMK and AIDMK switch sides between NDA and UPA. In UP, the BSP formed a government with the support of the BJP. SAD and National Conference became partners of NDA. Theoretically any party except BJP could fit into the UPA. The Third Front which went into oblivion immediately after its birth but is struggling to take shape again, can accommodate any party except BJP and Congress, while the NDA can take any party except the Congress and Communists. The exclusion and inclusion is more due to party competition and electoral considerations rather than ideological positions. The loss of values of ideology could be due to changing perceptions of the people, leaders and the followers at the ground level. Ordinary people hardly bother about ideological quarrels. For both, people and followers, pragmatic politics have become the norm. Parties are increasingly looked upon as means to serve personal interests. Now we see fewer and fewer leaders having fixed loyalties. Some political leaders change parties as per their convenience. The parties too now follow an “open door policy” in accepting leaders from other parties. The country has travelled a long way from the principled politics of 1950s to personalised politics today. Whether this flexibility of ideological values is better for our democratic future is matter of opinion and debate.